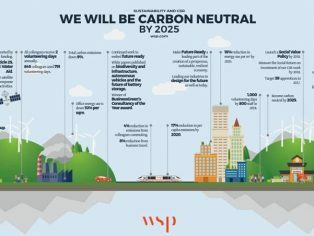 WSP has set a target for its entire UK business to become carbon neutral by 2025. WSP has also restructured how it delivers corporate social responsibility and sustainability with Claire Gott MBE the UK head of corporate responsibility and David Symons the UK director of sustainability. WSP’s sustainability offering revolves around its flagship Future Ready programme, which helps clients to design for future trends as well as today’s standards. As part of the restructure WSP has launched its WSP Foundation, which consolidates several charitable funding platforms (that currently support 80 UK charities) into one. Another target WSP has set itself is for 1,000 days of volunteering a year to be undertaken by 800 people. All WSP employees are eligible to take up to two volunteering days a year, with 645 colleagues using nearly 800 days in 2016 to help their local communities. Elsewhere in 2016, WSP saw its total carbon emissions down by nine per cent, office energy use and paper use down by 10 per cent and achieved a recycling rate of 93 per cent. “We are practising what we preach. Clients and colleagues alike say that they want to be ready for the future. That they want to be part of creating a prosperous, sustainable, resilient economy. There’s no better way to demonstrate how this is possible than by going carbon neutral ourselves by 2025. We are practising what we preach. Clients and colleagues alike say that they want to be ready for the future. That they want to be part of creating a prosperous, sustainable, resilient economy. There’s no better way to demonstrate how this is possible than by going carbon neutral ourselves by 2025. This is something we regularly help clients to achieve through designing renewable energy systems, ambitious energy reduction programmes, and sector initiatives such as the Airport Carbon Accreditation Scheme.